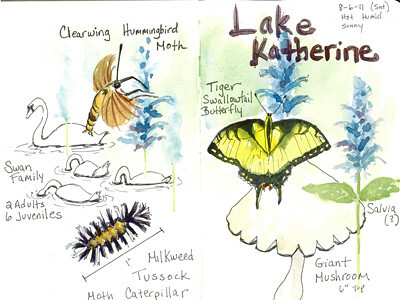 Nature at Lake Katherine Sketch – Let's Paint Nature! Do you want to go on a virtual field trip with me to Lake Katherine?!? Fascinating nature is ooozing from every corner this time of year and we’re loving every inch of it! First, we’ll start in the garden. 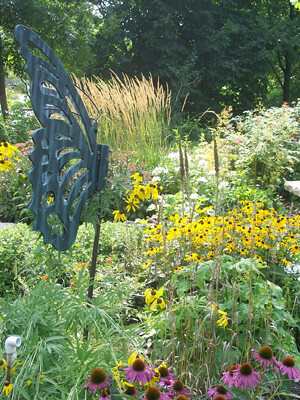 Black-eyed Susans, Purple cone flower, and ornamental grasses surround the butterfly sculpture. And who enjoys the garden besides us? This tiger swallow butterfly enjoys the garden by drinking sweet nectar. 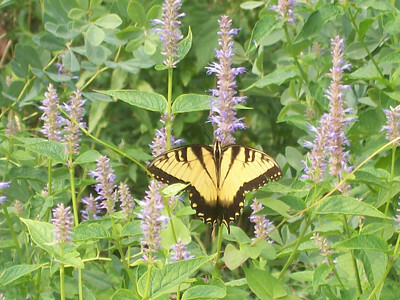 I think this plant is Salvia, however I could be wrong. 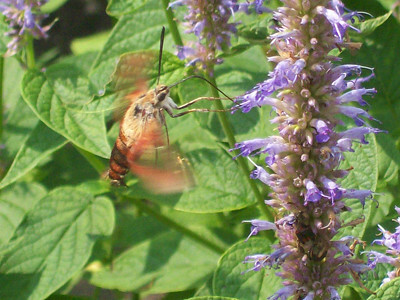 The clearwing humming bird moth also loves this plant too. Walking on the trail, I encountered this HUGE mushroom. 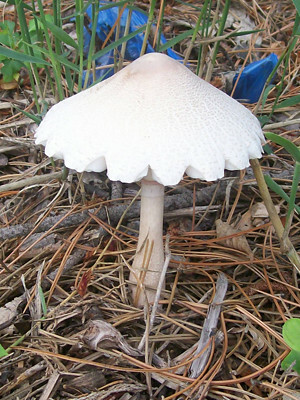 The top was about 6″ wide and the entire mushroom had to be 6″ tall. I do not know what type of mushroom this is with scalloped edges. Or maybe perhaps it is so large that the top split on the edges when opening? Continuing on our trail…..look who’s crossing! 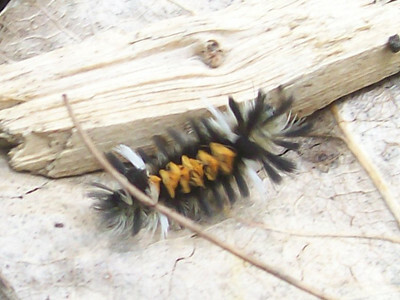 A milkweed tussock moth caterpillar…..WHOA! He looks like a tiny (1″ long) yellow pipe cleaner with white and black hair tufts. NEAT! Finally we reach the lake and see our swan family. Dad, mom, and 6 juveniles swim together. The young fish for something good to eat and I love to watch them. I hope you enjoyed this quick get-a-way to Lake Katherine in Palos Heights, IL. ← Let’s Paint an Old Barn and Red Clover! 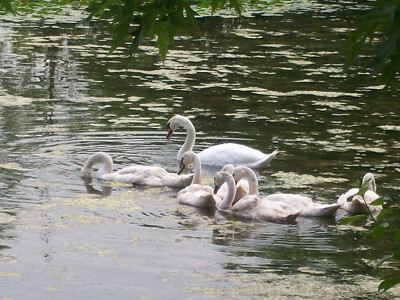 Love the nature photos and the swan family. Wonderful post. Eileen: Thank you! Lake Katherine is a special place to escape for peace and tranquillity. Love it all, especially the elegantly skirted mushroom.